The supervisory board of Southeastern Estonia's Põlva Hospital has submitted an application to the Estonian government to cover the loss incurred by providing maternity services with €200,000 this year. Should the request be satisfied, the hospital's maternity ward will remain open through the end of next year. According to Põlva Hospital supervisory board chairman Mart Einasto, he met with both representatives of Põlva Municipal Council as well as Municipal Mayor Georg Pelisaar, and a joint agreement was reached that the maternity ward at Põlva Hospital would continue operating through the end of 2019, spokespeople for Tartu University Clinik (TÜK) told BNS on Monday. The Põlva maternity ward was initially scheduled to be closed on 1 October. Einasto said that the municipal government is actively working to ensure that the hospital receives an additional €200,000 in funding next year as well. "The financing for next year is still up in the air, but the local government has affirmed that they will find the necessary money in any case," he added. He said that the application for money sent to the government is based on previous negotiations with Prime Minister Jüri Ratas (Centre) and Minister of Rural Affairs Tarmo Tamm (Centre), who have affirmed their wish to support the hospitals of Southeastern Estonia. 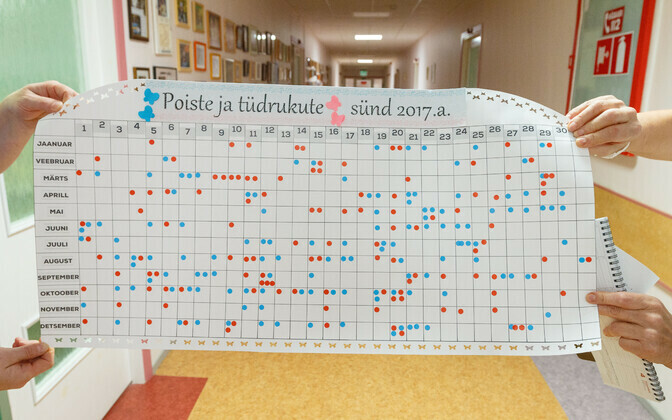 Pelisaar said that the €200,000 to cover this year's loss will hopefully come from the government, but next year the municipality together with the hospital will make efforts to get another €200,000 with which to continue operations at the maternity ward through the end of December. "Where the money will come from is still up in the air — we are deliberating various options," he said. "But we hope to also get support from the Southeastern Estonia programme launching next year, and we hope that all three local governments of Põlva County will be behind this decision." The maternity ward at Valga Hospital, however, closed last week already due to a shortage of staff. It was originally schedued to remain open through 1 July. Valga Hospital's maternity ward had seen a total of 50 births in the first four months of 2018. The hospital supervisory board had decided in April to close the maternity ward as of 1 July, as the Estonian Health Insurance Fund (EHIF) had proposed to the hospital to stop financing maternity services there. The supervisory board on Monday submitted an application to the Estonian government to cover the maternity ward's loss this year in the extent of €100,000. Chairman of the Valga Hospital management board Marek Seer said that the hospital will continue to provide assistance to all who turn to the hospital. "If an expecting mother comes to our door, we will not send her away, but provide professional care to the best of our ability," he explained. "If we ourselves are unable to solve the situation, they will receive safe ambulance or paramedic service transport to TÜK." According to Einasto, the networking of hospitals first and foremost means that TÜK will share its knowledge with Southeastern Estonian hospitals, whether in the form of training doctors or issues connected to the monitoring of the quality of medical care. "This does not mean that we must start forcing Tartu doctors to work in Valga or Põlva; we could send doctors on official assignments to Valga, but this would be unreasonably expensive and not the way to solve the problem," he said. The EHIF proposed to TÜK to close the maternity wards at Põlva and Valga Hospitals as increasing numbers of expecting mothers from these regions preer to give birth at the larger hospital in Tartu.